If an operation is performed on any two numbers in a set and the result is still in that set, we say that the set is closed under that operation. For example, we can say that the set of positive integers is closed under addition because if we add any two positive integers, the result is still a positive integer. On the other hand, the set of positive integers is NOT closed under subtraction because in many cases, the result is a negative integer (e.g 9 – 12 = -3). The video below is one of the best videos I’ve seen so far explaining closure property This video is just one of a series of videos about Imaginary Numbers. Did you enjoy the video? If yes, kindly share it to your friends. Imaginary numbers had no use when it was invented except for intellectual exploration until it was linked to coordinate geometry. The complex number can be plotted as the ordered pair where is the real part and is the imaginary part. Therefore, the complex numbers , , , and can be plotted as , , , and in a “coordinate plane” respectively as shown below. In the figure, we can see that the origin is and that , the complex conjugate of , is its reflection along the x-axis (Can this be generalized?). The plane where the complex numbers are plotted above is called the complex plane. In the complex plane, we can observe that all numbers of the form are real numbers and these numbers are represented by the horizontal axis. The numbers of the form are all imaginary numbers and it is represented by the vertical axis. Thus, we can call them the real axis and the imaginary axis respectively. In addition, we can conclude that all real numbers are complex numbers since for all real numbers , . 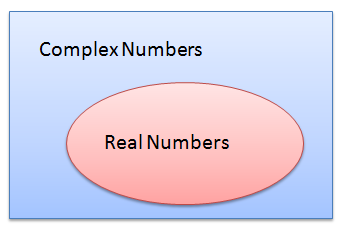 So, the set of real numbers is a subset of the set of complex numbers. Imaginary numbers as we have discussed in Tuesday’s post are numbers of the form bi where is a real number and . 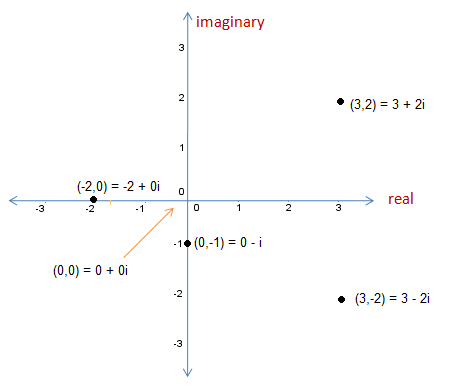 The term imaginary as (opposed to real) was first used by Rene Descartes, the mathematician who invented Coordinate Geometry — the Cartesian plane in particular. Leonhard Euler was the one who introduced the symbol for .